It seems like Relapse death squad Misery Index are always on the road, hitting that pavement hard to spread their biting social commentaries and politically-informed diatribes to the unwashed masses. They've recently announced a February/March tour with like-minded crucial moshers Magrudergrind, and they're gearing up to launch an attack on Noisecreep's home base, New York City, on March 20. 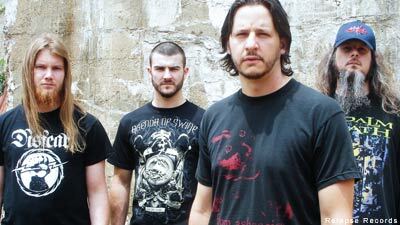 Mark Kloeppel (guitar/vocals) told Noisecreep, "Magrudergrind are longtime friends of ours. They are a really great grind band; one of the best of the genre -- and right out of D.C. too! We have always wanted to tour with them, so we jumped on it! "We love underground grinders and anarchist punks, and we expect to see a lot of those type of folks out at these shows. Because of the death metal in our sound," Kloeppel explains. "We get pitched for a lot of metal tours that punk kids won't go to, which is why it's refreshing to do these types of tours." Kloepper continues, "No dis on the metal scene, but it does not seem to be as socially aware as the punks or ginders. Metal is more in the fantasy realm, whereas punk and grind are more in touch with grim realities. Given our lyrical content, we really appreciate those who choose and maintain a non-mainstream lifestyle for the sake of real change versus a teenage-angst-inspired rebellion in a world that doesn't exist." Misery Index have been hard at work recording the follow-up to 2008's vicious 'Traitors,' a process that Kloeppel admits is made even more difficult by the band's rigorous touring schedule. "We live for traveling the world and visiting with all our friends, but i does hinder quality time spent writing. This last one came together very fast, but I'm happy to say that we didn't miss a beat. We did alot of preproduction and preparation for the studio, and it shows on the album. 'Heirs to Thievery' will come out 18 months after the debut of 'Traitors.' That's an incredible turn-around on anyone's watch, given our consistent massive touring schedule. I feel the new material is very strong, and represents a maturing of our sound. "'Heirs to Thievery' is the brutal, organic response to all the lifeless, emotionless computerized records comeing out these days. We are more ferocious and poetically poignant these days, and I think a Misery Index fan will feel that," he maintains, clearly satisfied with his band's latest effort. After they wrap up their run with Magrudergrind, Misery Index will be heading right back out, blazing a trail through the Southeast with technical death metallers Gigan then heading to the lands down under with newly reborn Polish death metal goliaths Decapitated, Aussie spastics Psycroptic and brutally intense labelmates Origin on a tour scheduled to hit Australia, New Zealand, Malaysia and Taiwan.